Let’s try harder | A contemporary gallery of art, design, film and music. 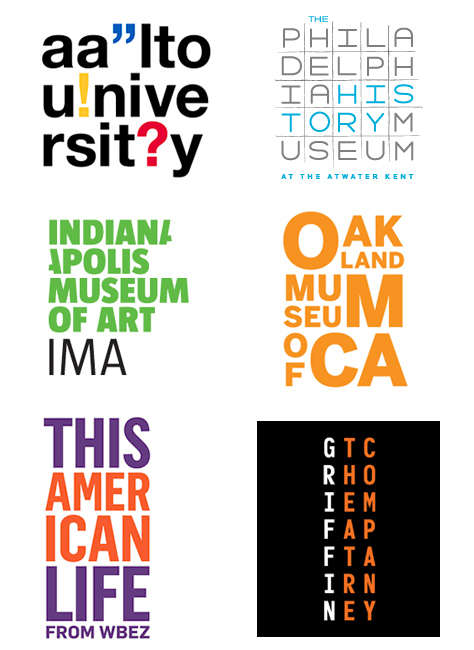 A lot of recent logo redesign projects have been using a similar stacked-letters approach – some better than others of course. While this is hardly a new style, I couldn’t help but notice that additionally, almost all of them are for museums, galleries, libraries or other public arts/education categories. I understand how the design challenge of creating a mark to represent thousands of paintings or millions of books without focusing on any one aspect might lead you to cop out solve using only typography, but this is getting ridiculous. If these places were commercial brands they would be direct competitors, and the slightest bit of research into the landscape would tell you to avoid that design direction. So why not in this area? I can’t think of any real value by creating a visual familiarity between these places. Don’t we want great museums and etc. to feel like unique destinations? I love typography, but the ubiquitous use of this design style dilutes all of the marks involved (even the good ones) and suggests a lack of awareness or creativity – the very last thing you want associated with your art/culture brand. Let’s try harder.